Spain is located on the Iberian Peninsula in Western Europe, south of France. The peninsula lies between the Atlantic Ocean and the Mediterranean Sea. Creating a natural border with France are the Pyrenees Mountains. Spain is surrounded on three sides by water – to the north is the Cantabric Sea, to the west is the Atlantic Ocean, on the east, is the Mediterranean Sea. Just across the Straight of Gibraltar lie Morocco and Algeria. With so many miles of coastline, it is easy to understand why Spaniards consume so much seafood! Not many people realize it, but Spain is the most mountainous country in Europe after Switzerland and has a wide variety of climates – from the hot, dry region of Andalucía in the South, to the lush, green and humid zones of Galicia and Asturias in the North and Northwest. In Spain, you can ski in Granada one day and go to the beach the next! Spain lies at approximately the same latitude as California, so it has similar weather. Spain has been invaded over the centuries by various peoples, including the Phoenicians, the Romans, and the Moors. For centuries Spain was divided into small feudal kingdoms that had their own money, culture, languages and food! Although Spain is one country and two basic ingredients common to all regions are garlic and olive oil, there are large regional differences in cuisine. The North of Spain where we find lots of sauces and seafood, such as the regions of Galicia and Asturias. The Pyrenees, home of the chilindrones, sautéed peppers, tomatoes and onions dish that accompanies many of the region's dishes. Cataluña region where casseroles or cazuelas abound. 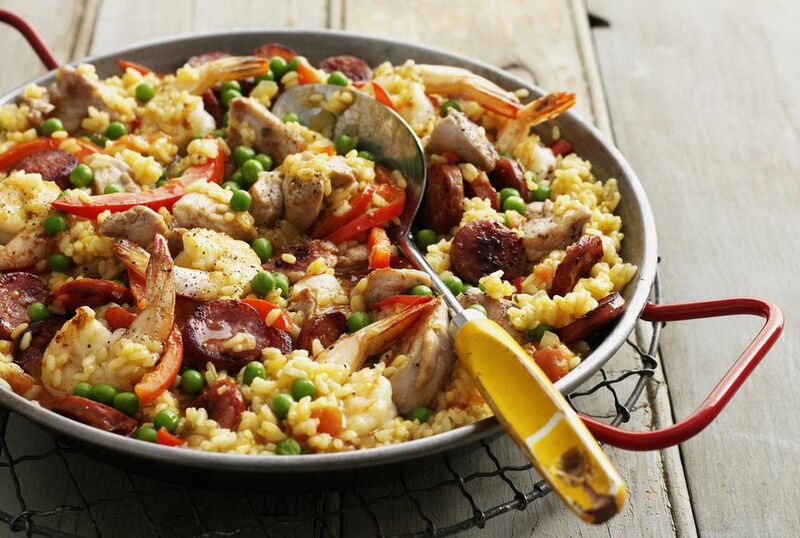 The Eastern region, which includes the Autonomous Community of Valencia, where the primary dishes are rice-based like the popular Paella Valenciana. Andalucía, where fried fish is a staple and bars don’t serve a drink without a tapa to munch on. Central Spain where roast meats and cocidos or stews dominate the daily diet. This would include the region of Castilla-Leon. Over the centuries, Spanish cuisine has been influenced by many other cultures, both invaders and visitors, as well as from its colonies. 1100 B.C. – The Phoenicians arrived in the South, and established a colony called Gádir, the modern day Cádiz. This became an important trading center. The Phoenicians stayed for centuries, establishing more colonies in what is today Huelva and Malaga. In 218 B.C., the Romans arrived at the Iberian Peninsula. It was then that the Romanization of the Peninsula began and what we could consider the start of the history of Spain as a nation. The Romans brought not only their government, culture, and art, but their agricultural technology, too. Grape-growing and wine-making, olive cultivation and pressing techniques came to the Peninsula. Hispania (the Roman name for the Peninsula) was part of the Roman Empire for over 500 years. During this period, a blending of cuisines took place, with Hispania being an important producer of food for the Empire. In 711 A.D., the Moors crossed the Straight of Gibraltar from Africa and invaded the Peninsula. They quickly established themselves in South and Central Spain and they flourished for many centuries. The Moors brought with them advanced agricultural technology, rich spices, new fruits and vegetables. In 1492, with the discovery of the New World came revolutionary changes to Spanish cuisine, as well as the rest of Europe. The Spanish explorers brought back many new and exotic foods, such as potatoes, tomatoes, corn, avocados, papayas, peppers and cacao for chocolate. If you like variety, then Spanish cuisine is for you. Want a change? Try another region’s food!